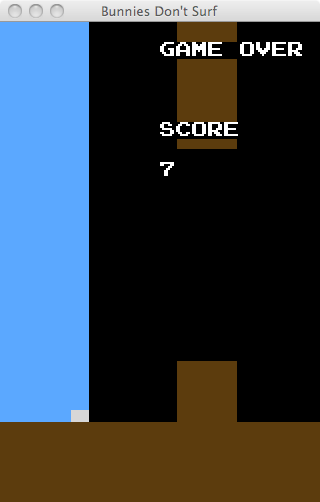 Here’s a WIP FlappyBird-like game prototype for #flappyjam: Bunnies Don’t Surf. You are an unfortunate rabbit whose warren is being flooded by a passing thunderstorm. You have to navigate the tunnels of the warren, propelled by the wave of water flooding your home. There’s only one problem: Bunnies Don’t Surf. So you’re stuck hopping up and down in a futile attempt to survive. Bunnies Don’t Surf requires Python and pygame (version 1.9.1) to play. Tap SPACE to hop. That’s about all there is to say about the controls. As I’m sure you can see, the game is in dire need of art assets, sound assets, and some sort of high score system. I’ll do my best to add these, once time allows. If anyone has feedback or art design ideas, please let me know in the comments section or on Twitter. I’d love to hear it. I’ll post updates as the game progresses, and officially submit it to #flappyjam if it’s done before the jam ends on February 24.